Clustered databases, web infrastructure, and financial services are just a few applications that will achieve significant throughput and latency improvements resulting in faster access, real-time response and more users per server. 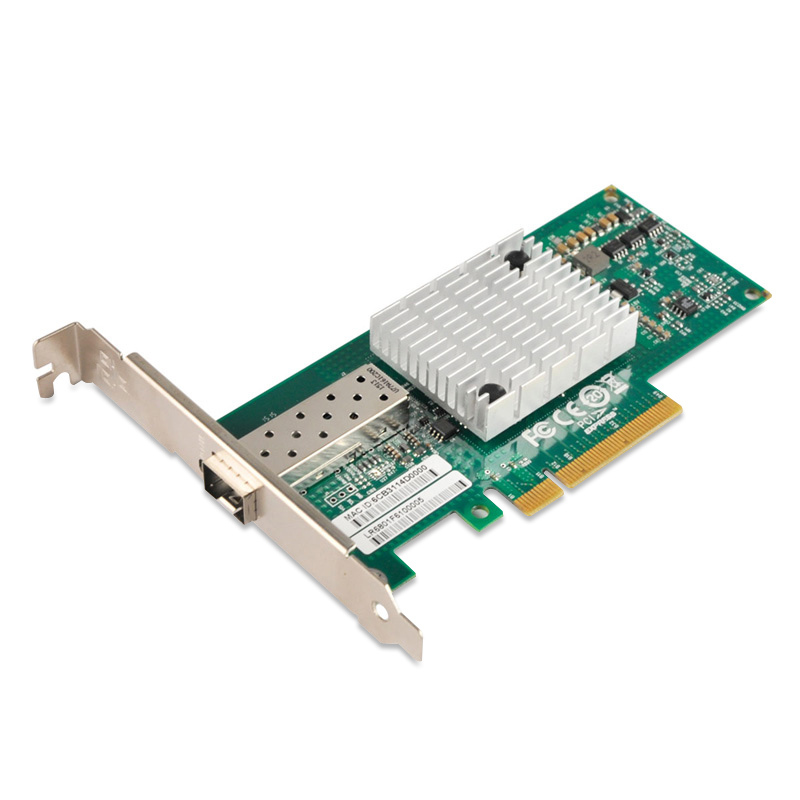 The NIC-6821XF-SFP10G improves network performance by increasing available bandwidth while decreasing the associated transport load on the CPU and providing enhanced performance, especially in virtualized server environments. The device is well suited for Blade Server and LAN on Motherboard (LOM) designs due to its small overall footprint requirement. The NIC-6821XF-SFP10G removes I/O bottlenecks that are limiting application performance in mainstream servers. Servers supporting PCI Express 2.0 with 5GT/s will be able to fully utilize both 10Gb/s ports, balancing the I/O requirement of these high-end servers. Hardware-based stateless offload engines handle the TCP/UDP/IP segmentation, reassembly, and checksum calculations that would otherwise burden the host processes. Wake on LAN feature provide the ultimate power saving mode for unutilized server, to fully optimize the operational cost. Total cost of ownership is optimized by maintaining an end-to-end Ethernet network on existing operating systems and applications. Integrated CX4, KX4, XFI and KR PHYs reduce the number of components required. This in turn reduces the power, board space, and complexity of the system compared to other solutions. Each port is independently configured, increasing the options available to OEMs. The NIC-6821XF-SFP10G delivers the features needed for a converged network with support for Data Center Bridging (DCB). T11 compliant FCoE support with full hardware offloads simplifies the storage network while keeping existing Fibre Channel targets. IBTA RoCE technology provides efficient RDMA services, delivering low-latency and high performance to bandwidth and latency sensitive applications. With link-level interoperability in existing Ethernet infrastructure, Network Administrators can leverage existing data center fabric management solutions. The NIC-6821XF-SFP10G provides dedicated adapter resources and guaranteed isolation and protection for virtual machines (VM) within the server. The NIC-6801AF-SFP10G gives data center managers better server utilization and LAN and SAN unification while reducing costs power, and complexity. Resource allocation per application or per VMis provided and protected by the advanced QoS supported by The NIC-6821XF-SFP10G. Service levels for multiple traffic types can be based on IETF DiffServ or IEEE 802.1p/Q allowing system administrators to prioritize traffic by application, virtual machine, or protocol. This powerful combination of QoS and prioritization provides the ultimate fine-grained control of traffic ensuring that applications run smoothly in todays complex environments. The NIC-6821XF-SFP10G is supported by a full suite of software drivers for Microsoft Windows, Linux distributions, VMware and Citrix XENServer. ConnectX-2 EN supports stateless offload and is fully interoperable with standard TCP/UDP/IP stacks. ConnectX-3 EN supports various management interfaces and has a rich set of configuring and management tools across operating systems.